“Look, this wasn’t Morgan’s fault. It was my fault. Really. Man has always been fascinated by artificial intelligence. Either an attempt is made to create a properly functioning living being, by making use of human remains, such as in “Frankenstein”. In most cases a high-tech design containing artificial intelligence is made, as in “Ex Machina” or “Uncanny“. In “Closer to God“, the cloning of a human being is the central subject. Or as in “Splice“, you’ll see the manipulation of DNA from different organisms which leads to a reasonable bizarre looking being. Morgan (Anya Taylor-Joy) is the result of synthetic DNA and applying nanotechnology on the neural network of an organism. It’s a rapidly developing humanlike creature, whose intelligence and physical appearance grows exponentially. As Dr. Ziegler (Toby Jones) enthusiastically said : “A hybrid biological organism with the capacity for autonomous decision-making and sophisticated emotional responses“. But as always, deficiencies can be found in this seemingly perfect creation. As in all the above-mentioned similar stories, those who carried out the task of creator of human life (in religious circles the expression divine intervention would be used rapidly), will become victims of their own creation. That’s something Dr. Grieff Kathy (Jennifer Jason “The hateful Eight” Leigh) experienced first-hand. A talk session with Morgan, who flew into an abusive rage, ends with a pierced eye. But like all other scientists who try to create artificial life, an emotional bond is being formed between the creator and the creature which leads to a rather protective attitude from the scientists. We see the same here as Lee Weathers (Kate Mara) is summoned to assess the situation and to take the decision whether or not to proceed with the Morgan project. This could mean the termination of Morgan’s existence. The film was directed by Luke Scott, son of my “all time favorite” director Ridley Scott. Unmistakable he inherited the qualities as a director from his father. Even though the story isn’t exactly groundbreaking, Luke Scott manages to create some suspense. Of course, the acting of Anya Taylor Joy and Kate Mara also played an important role. Morgan is kind of creepy, despite her human appearance, with her pale white face and jet-black piercing eyes. The same look as in “The VVitch“. But it is mainly her attitude and composure that impresses. A shrewd and thought out look. And yet, Morgan can transform any moment into a raging fury, harboring a deadly aggression. Lee Weathers has that same calmness and sobriety with which she approaches the facts. Two equal personalities ending up in a fierce confrontation. 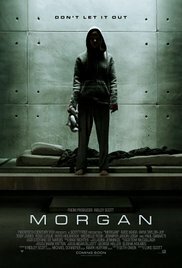 The given situation with Morgan behind armored glass, was a perfect opportunity to increase the tension between Morgan, Lee Weathers and those who created her. Immediately it made me think of “The Silence of the Lambs“. The only thing that annoyed me the most, was the intervention of Dr. Alan Shapiro (Paul Giamatti). An unstable, artificial experiment attacks a staff-member in an aggressive manner, yet this tactless, blasé behaving psychiatrist can interview it without any protection. When this ignoramus starts to provoke Morgan in a challenging way, the outcome is really predictable. What else did this charlatan expect to happen? A miraculous personality change? Although this scene conveys an overall stupidity, it’s a very intense moment. It’s, as it were, a tilting moment in the film. Giamatti plays his part in a brilliant way. This actor knows how to pick his roles. Mostly it isn’t a decisive leading part, but each character Giamatti chooses, plays a crucial role in the course of the film. The chauffeur Ralph in “Saving Mr. Banks” is another example. But despite the strong performances and intriguing subject, this felt like a mediocre film to me. Probably because I could guess already in advance which way it was going. Even the crazy, violent denouement with a rampaging frenzy Morgan in the lead, couldn’t change the ordinary feeling of mediocrity. A kind of “light” version of “Ex Machina“. Everything that made the latter so overwhelming, was missing here.